Naturally occurring microbial superantigens (SAg) have been implicated in several human idiopathic disorders, and a compelling argument for the role of SAg in autoantibody-associated disorders, such as systemic lupus erythematosus, has been proposed. To test the effects of SAg on human in vitro Ig responses, CD4+ T cell + B cell cultures were stimulated with graded doses of staphylococcal enterotoxin B (SEB). Ig-secreting cell (IgSC) responses were very weak in CD4+ T cell + B cell cultures stimulated with SEB at the optimal mitogenic concentration (high dose SEB; 100 ng/ml) but were strong in parallel cultures stimulated with low dose SEB (0.01 ng/ml). High dose SEB actually enhanced B cell differentiation in the presence of CD4+ T cell soluble helper factors as long as the B cells were prevented from physically contacting the CD4+ T cells. However, when cell-cell contact between CD4+ T cells and B cells was permitted, high dose, but not low dose, SEB promoted increased CD4+ T cell-mediated B cell apoptosis with resulting decreases in viable CD20+ B cells and IgSC. High dose, but not low dose, SEB triggered increased levels of soluble CD95 ligand, and down-regulation of IgSC responses and incremental apoptosis of activated B cells were prevented by antagonist anti-CD95 mAb. This strongly suggests that CD4+ T cell-mediated CD95-based killing of activated B cells plays a major role in controlling SEB-driven IgSC responses. Defects in SAg-based down-regulation may contribute to autoimmune disorders such as SLE. Naturally occurring microbial superantigens (SAg)3 have been implicated in several human idiopathic disorders, including Kawasaki disease (1, 2) and rheumatoid arthritis (3, 4). In addition, a compelling argument for the role of SAg in autoantibody-associated disorders, such as systemic lupus erythematosus (SLE), has been proffered (5). By “bridging” specific Vβ-expressing Th cells to MHC class II-expressing B cells, SAg could promote T cell-dependent polyclonal B cell differentiation. Indeed, chronic SAg administration to non-autoimmune-prone mice has resulted in polyclonal hypergammaglobulinemia and increased titers of autoantibodies (6, 7). We have previously documented a dichotomous in vitro Ig-secreting cell (IgSC) response to staphylococcal SAg. At doses orders of magnitude lower than those needed for maximal T cell proliferation, SAg can promote vigorous IgSC responses in PBMC cultures. In contrast, the number of IgSC is markedly reduced at higher (more mitogenic) SAg doses (8, 9). Others have also shown that large doses of SAg can be inhibitory to Ig production in vivo (10) and in vitro (11, 12, 13, 14). The basis underlying the normal dichotomous IgSC response might offer important insight into the pathogenesis and/or treatment of idiopathic disorders characterized by polyclonal hypergammaglobulinemia. In this report, we demonstrate that high dose staphylococcal enterotoxin B (SEB) actually enhances B cell differentiation in the presence of SEB-triggered T cell helper factors. In a milieu containing high dose SEB and CD4+ T cells, robust IgSC generation is evident as long as the T cells are prevented from physically engaging the B cells. However, when CD4+ T cells, even in the absence of CD8+ T cells, can intimately contact the B cells, the net result is increased B cell apoptosis and inhibition of IgSC responses via a CD95 (Fas)-based pathway. PBMC were isolated from venous blood of healthy donors on the day of blood collection (day 0) by Ficoll-Hypaque density gradient centrifugation (15). Unfractionated T cells (>95% CD3+), CD8− T cells (∼90% CD4+), and B cells (50–90% CD20+ with undetectable CD3+ cells) were isolated by negative selection (8, 9). In some experiments, CD4+ T cells (>99% CD4+) and B cells (> 99% CD20+) were isolated by positive-selection cell sorting using FITC-conjugated anti-CD4 mAb and FITC-conjugated anti-CD20 mAb, respectively (Dako, Carpinteria, CA). Cultures were established in RPMI 1640 medium supplemented with 10% FCS and glutamine and antibiotics (15). A two-chamber culture design was utilized in which 1 × 105 B cells were cultured inside Transwell inserts (Costar, Cambridge, MA) and 5 × 105 T cells (along with 2 × 105 irradiated B cells as “SAg-presenting cells” (SPC)) were cultured outside the inserts. The cells outside and inside the inserts shared a common medium, but physical contact between the two sets of cells was prevented. (The T cells in the outer chambers supplied the requisite soluble helper factors for the target B cells in the inner chambers to differentiate into IgSC in the absence of intimate T cell contact. Unfractionated T cells and CD4+ T cells were each able to serve such helper function (data not shown).) The cultures were stimulated with high dose SEB (100 ng/ml; Sigma Chemical Co., St. Louis, MO) or low dose SEB (0.01 ng/ml) (1 ml final total volume), and plaque-forming cells (PFC) were detected in duplicate at days 6 to 7 by the reverse hemolytic plaque assay (15, 16). Each PFC is taken as an IgSC. When indicated, the cultures were also stimulated with formalin-fixed heat-killed Staphylococcus aureus (SAC) (Life Technologies, Gaithersburg, MD; 1:105 final dilution) + rIL-2 (10 U/ml). “Down-regulatory two-chamber cultures” were established containing activated CD4+ T cells in the outer chambers and activated B cells in the inner chambers. To generate these activated populations, CD4+ T cells and B cells were individually activated overnight on day 0 with high dose SEB and high dose SEB + SAC (1:105 final dilution) + rIL-2 (100 U/ml), respectively. These individual cell populations were washed and respectively plated outside and inside Transwell inserts for 4 days without further stimulation. 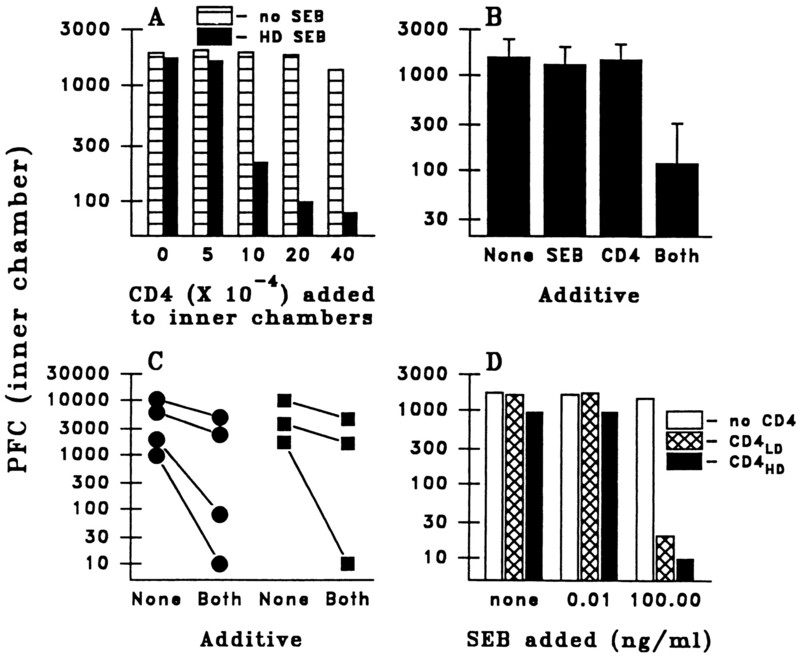 To effect the down-regulation, CD4+ T cells (4 × 105 unless otherwise indicated) that had been SEB activated in parallel were added ± additional SEB on day 5 to the inner chambers containing the activated B cells. PFC were determined 2 days later (day 7). Down-regulatory two-chamber cultures were established with the addition on day 5 of activated CD4+ T cells + high dose SEB to the inner chambers. At that time, antagonist anti-CD95 mAb M3, nonagonist/nonantagonist anti-CD95 mAb M33 (17), polyclonal goat anti-human TNF-α IgG, polyclonal goat anti-human TNF-β IgG, or nonimmune goat IgG (R&D Systems, Minneapolis, MN) was also added to protect from the CD4+ T cell-mediated down-regulation. Protection from down-regulation of PFC responses was calculated by the formula: [(PFC in the presence of added activated CD4+ T cells/SEB with test Ab) − (PFC in the presence of added activated CD4+ T cells/SEB without test Ab)] ÷ [(PFC in the absence of added activated CD4+ T cells/SEB) − (PFC in the presence of added activated CD4+ T cells/SEB without test Ab)]. Total viable cell number in SEB-stimulated cultures was determined by direct cell counting in the presence of trypan blue. B cell numbers were calculated by staining the harvested cells with FITC-conjugated anti-CD20 mAb, analyzing by flow cytometry, and multiplying the total viable cell count by the percentage of CD20+ cells. B cells were activated with SAC (1:105 final dilution) + rIL-2 (10 U/ml) for 4 days and labeled with the fluorescent cationic membrane tracer, 1,1′-dioctadecyl-3,3,3′,3′-tetramethylindocarbocyanine perchlorate (DiI); (Molecular Probes, Eugene, OR). To do so, 2 × 106 B cells were incubated for 10 min in the dark at 37°C with 0.2 ml of a 10 μM DiI/300 mM sucrose solution. DiI specifically labels lipid membranes, and once introduced into a cell, DiI remains intracellular and diffuses laterally within the plasma membrane to uniformly stain the entire cell. Following a single wash in 300 mM sucrose, the labeled B cells were cultured with activated CD4+ T cells (ratio 2:5) + graded doses of SEB. In some experiments, anti-CD95 mAb M3 or M33 were also added. After two additional days (day 6), the cells were harvested, stained with FITC-conjugated recombinant human annexin V in calcium-containing binding buffer (Caltag Laboratories, Burlingame, CA), and analyzed by two-color flow cytometry. Cell debris, as determined by forward- and side-scatter characteristics, was electronically excluded from the analysis. B cells undergoing apoptosis were taken as DiI-labeled (red) cells that stained positively for annexin V (green). Fresh or SEB-stimulated CD4+ T cells + B cells were stained with FITC-conjugated anti-CD95 mAb DX2 (PharMingen, San Diego, CA) + PE-conjugated anti-CD20 mAb (Dako) and analyzed by flow cytometry. CD4+ T cells (2.5 × 106) (along with 1 × 106 irradiated B cells as SPC in 1 ml) were stimulated with low dose SEB for 5 days, washed, and restimulated with graded doses of SEB. Culture supernatants were harvested at the indicated times following restimulation for sCD95L determination (18). All analyses were performed using SigmaStat software (Jandel Scientific, San Rafael, CA). The B cell apoptosis results followed a normal distribution and were analyzed untransformed, but the PFC raw data required log transformation to achieve normality. The paired t test and one-way repeated measures ANOVA test were used when comparing two groups and ≥ three groups, respectively. Probability < 0.05 was considered to be significant. SAg avidly binds to MHC class II+ cells, including B cells (19, 20), and may activate B cells in the absence of T cells (21, 22, 23). Nevertheless, PFC responses are very poor in high dose SEB-stimulated cultures containing CD4+ T cells and B cells (9). To determine whether high dose SEB could support B cell differentiation in the absence of surface contact with T cells, two-chamber cultures containing T cells in the outer chambers and B cells in the inner chambers were utilized. SEB, in a dose-dependent manner, enhanced PFC responses in the inner chambers (Fig. 1⇓ left). Costimulation with SAC/rIL-2 augmented the PFC responses but did not alter the dose-dependent effects of SEB. In the absence of T cells in the outer chambers, SEB did not promote PFC generation (data not shown), similar to previous observations with a different SAg (21). SEB, in a dose-dependent manner, enhances differentiation of B cells in the presence of soluble helper factors. Left, Two-chamber cultures were established containing B cells in the inner chambers and T cells in the outer chambers. Cultures were stimulated with graded doses of SEB (nanograms per milliliter) with or without SAC/rIL-2. The inner chambers were assayed for total PFC on day 6. Results are shown as geometric means ± 1 SEM for the four experiments performed. Right, T cells were activated overnight with low dose SEB, and B cells were activated overnight with SAC/rIL-2 + no, low dose (LD), or high dose (HD) SEB. The populations were washed and respectively plated outside and inside Transwell inserts. These two-chamber cultures were not stimulated further, and total PFC were determined on day 6 of secondary culture. Results are shown for the three experiments performed. To demonstrate that the enhanced PFC responses were not simply the consequence of increased soluble helper factors, additional two-chamber cultures were established. The outer chambers contained T cells that had been activated overnight with low dose SEB, and the inner chambers contained B cells that had been activated overnight with SAC/rIL-2 + graded doses of SEB. No additional stimulus was added to these two-chamber cultures. Since the T cells in all the cultures were identically activated, any increase in PFC generation in the inner chambers by high dose SEB-preactivated B cells compared with that by low dose SEB-preactivated B cells could not be attributed to greater elaboration of T cell soluble helper factors. 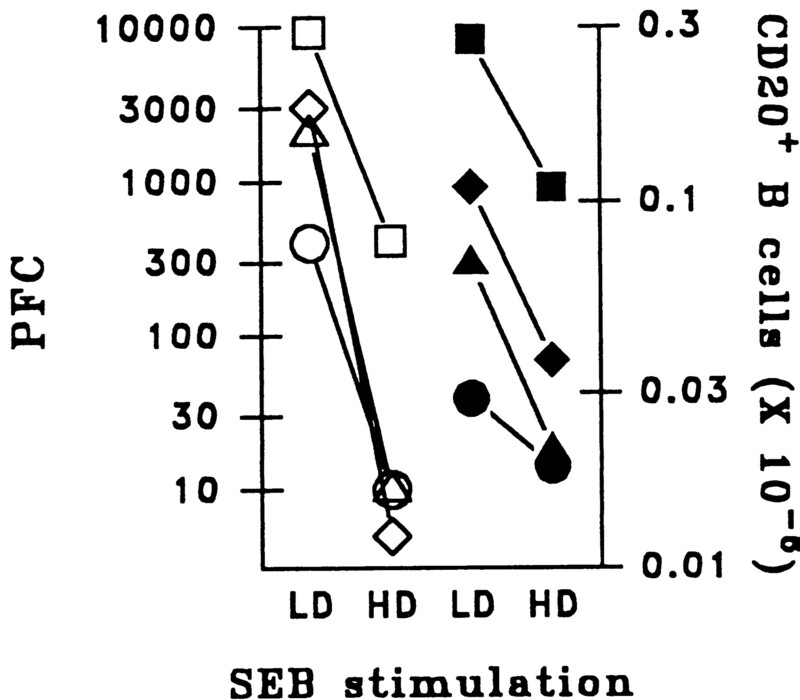 As shown in Figure 1⇑ (right), preactivation of B cells with SEB also enhanced PFC responses in a dose-dependent fashion, indicating that direct effects of high dose SEB on the B cells leads to enhanced PFC responses. On the one hand, high dose SEB enhanced B cell differentiation in the presence of T cell helper factors under conditions that prevented B cell surface contact with T cells (Fig. 1⇑). On the other hand, high dose SEB inhibited PFC responses under conditions that permitted surface contact between T cells and B cells (9). This suggested that the net PFC response to high dose SEB was critically affected by intimate T cell-B cell interactions. Since PFC responses were profoundly inhibited in low dose SEB-stimulated T cell + B cell cultures by addition of high dose SEB as late as 2 days before culture termination (9), we focused on late culture events. To that end, we utilized the down-regulatory two-chamber culture design described in Materials and Methods. Graded doses of activated CD4+ T cells ± high dose SEB were added to the B cells in the inner chambers 2 days before assaying for PFC. In the presence of high dose SEB, activated CD4+ T cells inhibited PFC responses in a dose-dependent manner (Fig. 2⇓A). Inhibition of PFC responses mediated by CD4+ T cells in the presence of high dose SEB was substantial (geometric mean 92%, range 50 to > 99%, p = 0.021) (Fig. 2⇓B). Multiple testing of two donors (four times over a 4-mo period and three times over a 3-mo period, respectively) demonstrated that addition of activated CD4+ T cells + high dose SEB repeatedly inhibited PFC responses in each donor by ≥ 50% (Fig. 2⇓C). When high dose SEB was added without activated CD4+ T cells, or when activated CD4+ T cells were added without high dose SEB, there was minimal effect on the PFC responses (Fig. 2⇓B). Importantly, addition of low dose SEB with high dose SEB-activated CD4+ T cells had no effect on the PFC responses (Fig. 2⇓D). In contrast, addition of high dose SEB, even in the presence of low dose SEB-activated CD4+ T cells, was profoundly inhibitory. Taken together, these experiments demonstrated that substantial down-regulation of PFC responses by SEB-activated CD4+ T cells requires both the presence of high dose SEB and physical contact between the CD4+ T cells and their B cell targets. Reduction of PFC responses effected by high dose SEB + activated CD4+ T cells. A, Down-regulatory two-chamber cultures were established. On day 5, the indicated numbers of high dose SEB-activated CD4+ T cells (CD4) were added to the inner chambers with or without high dose (HD) SEB. Total PFC in the inner chambers were assayed 2 days later. B, PFC responses in the absence of added activated CD4+ T cells or high dose SEB (none), in the presence of high dose SEB without activated CD4+ T cells (SEB), in the presence of activated CD4+ T cells without high dose SEB (CD4), and in the presence of both activated CD4+ T cells and high dose SEB (both) are shown as the geometric mean ± 1 SEM for the six donors tested. C, Total PFC responses from two donors were tested on four separate occasions over a 4-mo period (circles) or on three separate occasions over a 3-mo period (squares) in the absence of added activated CD4+ T cells or high dose SEB (none) and in the presence of both. D, On day 5, CD4+ T cells that had been activated with low dose SEB (CD4LD) or with high-dose SEB (CD4HD) were added to the inner chambers (containing activated B cells only) with the indicated doses (nanograms per milliliter) of SEB. Total PFC in the inner chambers were assayed 2 days later. Results are shown for one of the three such experiments performed. When CD4+ T cells and B cells were cultured together, high dose SEB inhibited not just PFC responses but viable B (CD20+) cell recovery as well (Fig. 3⇓). In contrast, total cell counts and absolute numbers of CD4+ T cells were increased in cultures stimulated with high dose SEB (data not shown). Cultures of sort-purified CD4+ T cells + sort-purified B cells excluded a vital role for contaminating CD8+ T cells or non-T/non-B cells in mediating reduction of B cell numbers and PFC responses in high dose SEB-stimulated cultures (Fig. 3⇓ (diamonds); data not shown). PFC generation and CD20+ cell recovery in cultures of CD4+ T cells + B cells stimulated with high dose vs low dose SEB. CD4+ T cells + B cells from four individual donors were isolated by negative selection (circles, squares, triangles) or by positive selection cell sorting (diamonds) and were stimulated with low dose (LD) or high dose (HD) SEB. At days 6 to 7, total PFC (open symbols) and CD20+ cell number (closed symbols) were determined. To document that the decrease in CD20+ B cells truly reflected their deletion rather than their maturation into the CD20− stage (24), B cells were SAC/rIL-2-activated for 4 days, labeled with DiI, and reconstituted with activated CD4+ T cells in the presence of graded doses of SEB for 2 additional days. Apoptosis was assessed by staining with FITC-conjugated annexin V (green) and analyzing the fraction of double-staining cells within the DiI (red)-staining cell population. B cell apoptosis was modestly, but significantly, enhanced in the presence of high dose, but not low dose, SEB (Fig. 4⇓). In the six experiments performed, B cell apoptosis increased from a mean 32.0% in the absence of SEB to a mean 42.5% in the presence of high dose SEB (p = 0.018). In the absence of activated CD4+ T cells, high dose SEB did not appreciably augment annexin V staining by DiI+ cells (data not shown), indicating that the B cell apoptosis was truly CD4+ T cell mediated. High dose SEB-dependent CD4+ T cell-mediated B cell apoptosis. B cells activated with SAC/rIL-2 for 4 days were labeled with DiI and reconstituted with activated CD4+ T cells in the presence of high dose (HD), low dose (LD), or no SEB. After two additional days, the cells were stained with FITC-conjugated annexin V and analyzed by flow cytometry. Results from one of two such experiments is shown. 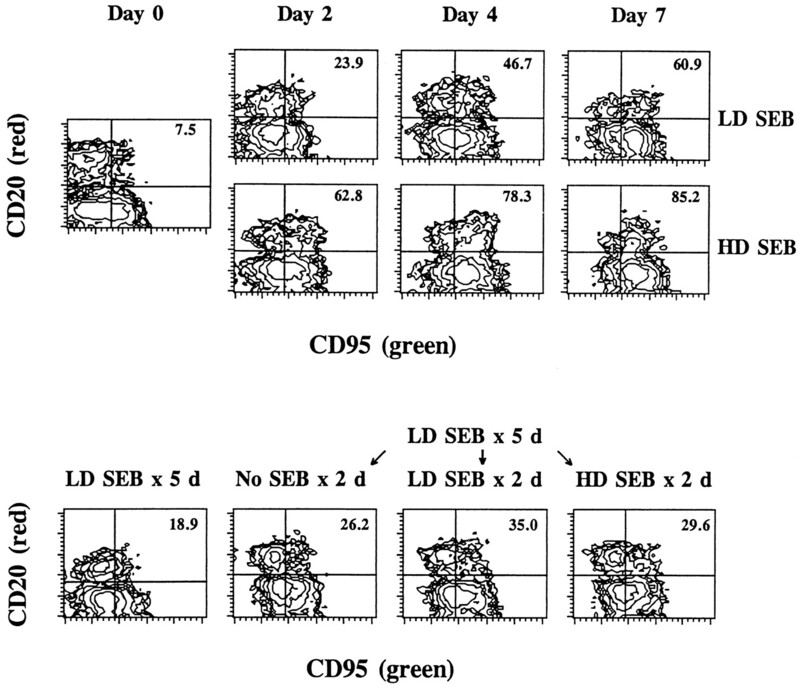 The numbers adjacent to the upper right quadrants indicate the percentages of labeled B cells (DiI+) positively staining with annexin V. In the experiment not shown, B cell apoptosis was 54.9% in the absence of SEB, 52.0% in the presence of LD SEB, and 68.3% in the presence of HD SEB. Murine CD4+ T cells can effect in vitro cytolysis of B cells and in vivo elimination of B cells via a CD95-based pathway (25, 26, 27). If CD95-based killing were playing a role in high dose SEB-dependent CD4+ T cell-mediated down-regulation of PFC responses, then B cell CD95 surface expression might be differentially up-regulated following stimulation with high dose or low dose SEB. In agreement with the observations of others (28, 29, 30), we detected little CD95 surface expression on nonactivated B cells (Fig. 5⇓, top). Increased B cell CD95 surface expression could be detected as early as day 2 in both low dose and high dose SEB-stimulated CD4+ T cell + B cell cultures, with B cell CD95 surface expression being far greater in the latter than in the former. B cell CD95 surface expression remained low in unstimulated cultures (data not shown). Importantly, however, substantial percentages of B cells in both high dose and low dose SEB-stimulated cultures were CD95+ by day 7 with similar staining intensities (Fig. 5⇓, top). Moreover, when low dose SEB-stimulated CD4+ T cell + B cell cultures were washed at day 5 and restimulated with no SEB, low dose SEB, or high dose SEB, B cell CD95 surface expression increased to a similar degree in each group (Fig. 5⇓, bottom). This indicated that B cell CD95 surface expression could continue to increase for a period of time even after the initial activating signal (low dose SEB) was removed. More importantly, stimulation with high dose SEB at this time no longer promoted incremental enhancement of B cell CD95 surface expression. Thus, B cell CD95 surface expression in low dose and high dose SEB-stimulated cultures was similar precisely at the time when PFC responses in high dose SEB-stimulated cultures were markedly depressed compared with those in low dose SEB-stimulated cultures (Fig. 3⇑). Up-regulation of B cell surface CD95 following stimulation with SEB. Top: Replicate sets of CD4+ T cell + B cell cultures were stimulated with low dose (LD) or high dose (HD) SEB, stained with FITC-conjugated anti-CD95 mAb + PE-conjugated anti-CD20 mAb at the indicated times, and analyzed by flow cytometry. The numbers in the upper right quadrants of the contour plots indicate the percentages of B (CD20+) cells positively staining for surface CD95. Bottom: CD4+ T cell + B cell cultures from a different donor were stimulated with LD SEB. On day 5, an aliquot of these cells was double stained for surface CD95 and CD20 (tracing at far left). The remainder of the cells were washed and recultured for two additional days with no, low dose, or high dose SEB. The cells were then stained and analyzed for CD95/CD20 surface expression. Since the effects of high dose SEB on B cell CD95 surface expression likely contributed only modestly, at most, to its down-regulatory effects on IgSC responses, we tested the effects of high dose SEB on CD95L. Staining experiments revealed that even in the presence of metalloproteinase inhibitor (31, 32), CD4+ T cell CD95L surface expression was minimal in all cultures regardless of SEB dose (data not shown). Previous successful detection of surface CD95L on nontransformed T cells by immunostaining has required potent (supraphysiologic) stimulation with PMA + ionomycin in the presence of metalloproteinase inhibitor for 24 to 48 h (18, 33). Thus, our inability to detect CD4+ T cell surface CD95L following high dose or low dose SEB stimulation is not surprising. In contrast, stimulation of resting CD4+ T cells (in the presence of irradiated B cells as SPC) with high dose SEB for as little as 1 day resulted in easily detectable increases in sCD95L levels (data not shown). Addition of high dose SEB to cultures containing only SPC did not result in increased sCD95L levels (data not shown), indicating that the sCD95L arose from the CD4+ T cells. Of great consequence, when 5-day low dose SEB-stimulated CD4+ T cells were washed and restimulated with graded doses of SEB, substantial increases in sCD95L levels were observed 1 and 2 days later only following restimulation with high dose SEB (p < 0.001) (Fig. 6⇓). That is, culture conditions that resulted in down-regulation of IgSC responses also resulted in elevated sCD95L levels, and culture conditions that did not promote down-regulation of IgSC responses also did not promote substantial increases in sCD95L levels. Importantly, in contrast to the very rapid (15 to 30 min) SAg-induced release of preformed sCD95L by monocytes (34), no increase in sCD95L levels was observed after 30 min of high dose SEB restimulation (data not shown). This suggests that the detected sCD95L was newly synthesized and not preformed. Increased sCD95L levels following stimulation with high dose SEB. 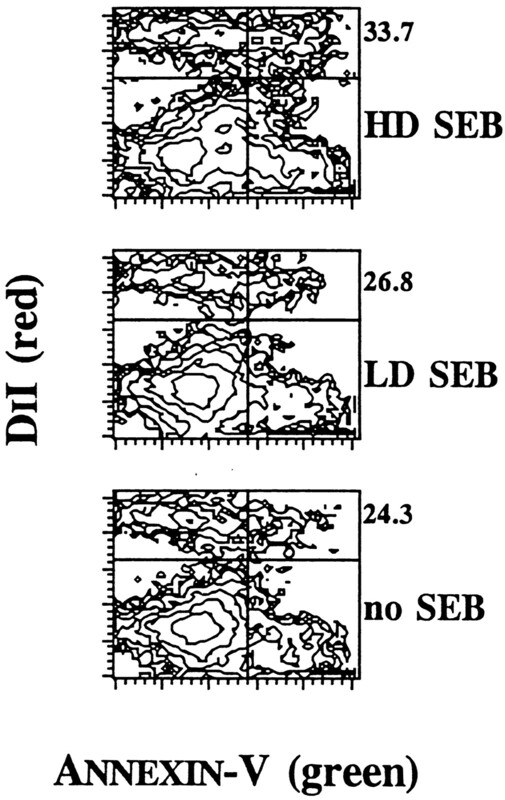 CD4+ T cell + irradiated B cell cultures were stimulated for 5 days with low dose SEB, washed, and restimulated with no, low dose (LD), or high dose (HD) SEB. Culture supernatants were harvested on day 1 (A) and day 2 (B) and assayed for sCD95L levels by ELISA. Results are shown for the four individual donors tested. Subsequent experiments conclusively demonstrated that CD95/CD95L interactions were crucial to high dose SEB-dependent CD4+ T cell-mediated down-regulation of IgSC responses, whereas TNF was not. Using down-regulatory two-chamber cultures, we added different Abs along with activated CD4+ T cells + high dose SEB to the inner chambers. In the five individual donors tested, antagonist anti-CD95 mAb M3 fully protected the PFC responses (p = 0.002 compared with no added mAb M3, p = 0.509 compared with no added SEB-activated CD4+ T cells + SEB) (Fig. 7⇓A). In contrast, neither nonagonist/nonantagonist anti-CD95 mAb M33 nor neutralizing anti-TNF-α + anti-TNF-β Abs were protective (Fig. 7⇓B). The anti-TNF Abs were not inherently inhibitory to PFC responses, since addition of anti-CD95 mAb M3 with anti-TNF Abs remained fully protective. Antagonist anti-CD95 mAb M3 protects against high dose SEB-dependent CD4+ T cell-mediated down-regulation of PFC responses. A, Down-regulatory two-chamber cultures were established. On day 5, 4 × 105 activated CD4+ T cells + high dose SEB (CD4/SEB) were added to the inner chambers (containing 1 × 105 activated B cells). At the same time, antagonist anti-CD95 mAb M3 (10 μg/ml) was added. Total PFC in the inner chambers were assayed 2 days later. Results for the five individual donors are plotted. B, One experiment from A is shown in greater detail. 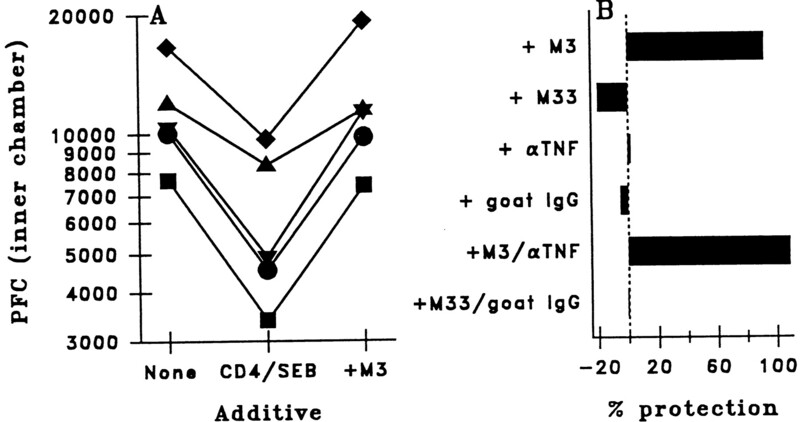 At the time that the activated CD4+ T cells + high dose SEB were added to the inner chambers, antagonist anti-CD95 mAb M3, nonagonist/nonantagonist anti-CD95 M33 (10 μg/ml), polyclonal goat anti-human TNF-α IgG + polyclonal goat anti-human TNF-β IgG (αTNF; 10 μg/ml of each), or nonimmune goat IgG (20 μg/ml) were also added. Protection from PFC down-regulation was calculated as described in Materials and Methods. The dashed vertical line denotes 0% protection. Importantly, antagonist anti-CD95 mAb M3 also inhibited high dose SEB-dependent CD4+ T cell-mediated B cell apoptosis, whereas control anti-CD95 mAb M33 had no such effect (Fig. 8⇓). Thus, high dose SEB-dependent CD4+ T cell-mediated down-regulation of IgSC responses and apoptosis of activated B cells were completely reversed by interrupting CD95/CD95L interactions. Antagonist anti-CD95 mAb M3 protects against high dose SEB-dependent CD4+ T cell-mediated apoptosis of activated B cells. B cells activated and labeled with DiI were reconstituted with activated CD4+ T cells + no SEB (no SEB), + high dose SEB + control anti-CD95 mAb M33 (SEB + M33), or + high dose SEB + antagonist anti-CD95 mAb M3 (SEB + M3). Two days later, the cells were analyzed for apoptosis as in Figure 4⇑. The numbers adjacent to the upper right quadrants indicate the percentages of apoptotic B (DiI+) cells. SAg elaborated by ubiquitous microbes can promote polyclonal T cell-dependent B cell differentiation in vitro (8, 13, 14, 21, 35, 36, 37) and in vivo (6, 7, 38). By altering experimental conditions, SAg may instead inhibit in vitro or in vivo Ig responses (9, 10, 11, 12, 13, 14). This suggests a dynamic conflict between helper and down-regulatory activities in an ongoing SAg-driven immune response. Using SEB as a prototype SAg, we have demonstrated in this report that the interplay among CD4+ T cells, B cells, and SAg concentration profoundly affects the magnitude of SAg-driven polyclonal IgSC responses. SEB affects IgSC responses in diametrically opposing ways. On the other hand, SEB clearly enhances IgSC responses in a dose-dependent fashion in the presence of CD4+ T cell-derived helper factors (Fig. 1⇑), but in the absence of direct T cell-B cell surface contact. On the other hand, when CD4+ T cells can physically contact target B cells, low dose SEB continues to enhance IgSC responses but high dose SEB inhibits IgSC responses (9) (Fig. 2⇑). It must be stressed that the two-chamber culture design enabled us to assess down-regulation of activated B cells. 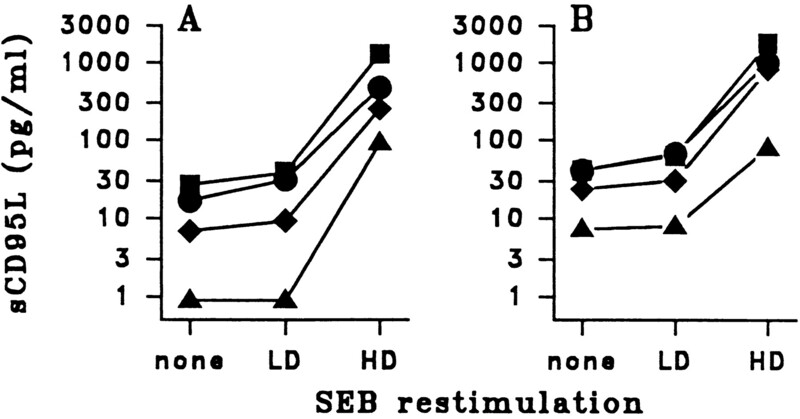 Thus, high dose SEB does not inhibit the activation of resting B cells. Rather, high dose SEB, under conditions permitting intimate contact between CD4+ T cells and B cells, results in functional inhibition of the activated B cells (IgSC) themselves. Neither CD8+ T cells nor non-T/non-B cells are essential for SEB-driven up-regulation or down-regulation of IgSC responses (Fig. 3⇑, data not shown), although either population may effect important regulatory functions under normal physiologic conditions. The ability of CD4+ T cells to kill B cell targets has previously been documented (25, 39), and CD4+ T cell-mediated B cell killing appears to also play a major role in high dose SEB-dependent down-regulation. Although high dose SEB-dependent increased B cell apoptosis was quantitatively modest (Fig. 4⇑), the apoptosis assay likely underestimated incremental high dose SEB-dependent killing of activated B cells. Only those cells that maintained their surface membrane integrity would have been included in the flow cytometry analysis. That is, activated B cells that had undergone full blown necrosis and spilled their intracellular contents into the medium would have been missed. Indeed, high dose SEB-dependent decreased B cell recovery was more substantial, although again it was not as dramatic as was high dose SEB-dependent down-regulation of IgSC responses (Fig. 3⇑). This may reflect either different sensitivities of the respective assays or may indicate preferential killing of IgSC or their near-immediate precursors. A definitive resolution to this issue requires further investigation. CD95/CD95L interactions are central to high-dose SEB-dependent down-regulation, with the key parameter likely being differential regulation of CD4+ T cell CD95L. Although B cell CD95 surface expression at early time points was up-regulated to a much greater degree in high dose SEB-stimulated cultures than in low dose SEB-stimulated cultures, B cell CD95 surface expression was very similar in high dose and low dose SEB-stimulated cultures at the time (day 7) when IgSC responses were profoundly down-regulated in high dose SEB-containing cultures. Indeed, despite its down-regulatory effects, late addition of high dose SEB to low dose SEB-stimulated cultures did not further augment B cell CD95 surface expression (Fig. 5⇑). In contrast, addition of high dose, but not low dose, SEB promoted profound increases in sCD95L levels in cultures containing either unstimulated or low dose SEB-activated CD4+ T cells (Fig. 6⇑, data not shown), findings that paralleled inhibition of IgSC responses. In addition to the likely importance of increased sCD95L release induced by high dose SEB, heightened B cell sensitivity to CD95-based killing following stimulation with high dose SEB may also play an important role in down-regulation of IgSC responses. Insensitivity of certain activated (CD95+) B cells to CD95-based killing has been reported (26, 28, 29, 40, 41), and this may relate to the nature and/or timing of B cell surface CD40 engagement. Under certain conditions, engagement of surface CD40 can prevent B cell death, including that triggered via surface CD95 (41, 42, 43, 44, 45, 46). On the other hand, a critical step in B cell sensitivity to CD95-based killing may actually be perturbation of B cell surface CD40 (26, 40, 47). CD4+ T cells transiently express surface CD40 ligand (CD40L) (48, 49), so differential kinetics of CD40L expression following stimulation with high dose or low dose SEB may have profound effects on ultimate B cell sensitivity to CD95-based killing and down-regulation. Additional experiments are necessary to assess this possibility. Despite elevated sCD95L levels in high dose SEB-stimulated cultures (Fig. 6⇑), down-regulation of IgSC responses was observed only when the CD4+ T cells and B cells could intimately interact (Fig. 2⇑). This requirement for close contact between effector CD4+ T cells and target B cells may reflect the need for very high local concentrations of sCD95L to effect down-regulation (apoptosis) or may indicate a vital functional role for transient surface expression by CD4+ T cells of CD95L. In any case, antagonist anti-CD95 mAb, but not nonagonist/nonantagonist anti-CD95 mAb, protected against both PFC down-regulation and B cell apoptosis (Figs. 7⇑ and 8⇑), results which are fully consistent with the established ability of CD4+ T cells to effect CD95-based killing (25, 50, 51, 52). Not only can CD4+ T cells promote SEB-driven IgSC responses (in the presence of low dose SEB) (9), but CD4+ T cells can down-regulate it as well (in the presence of high dose SEB) via a CD95-based pathway. Of note, activated CD4+ T cells effected no or minimal high dose SEB-dependent B cell cytolysis in 4-h 51Cr release assays (data not shown). It may be that CD4+ T cells require a > 4-h time interval to effect CD95-based killing of nontransformed B cells. In fact, CD95-based down-regulation of IgSC responses and CD95-based killing of activated B cells may be associated, but causally unrelated, phenomena. CD4+ T cells, in the presence of high dose SEB, may kill a population of activated B cells via a CD95-based pathway, but these B cell targets of killing may not necessarily be IgSC or their precursors. Conversely, CD4+ T cells, in the presence of high dose SEB, may down-regulate IgSC responses via a CD95-based pathway, but such down-regulation may not necessarily be effected via immediate B cell death. Additional studies are needed to resolve this issue. Although antagonist anti-CD95 mAb M3 was highly protective, CD4+ T cells, under physiologic conditions, may also effect SAg-dependent down-regulation of IgSC responses via non-CD95-based pathways. TNF is an unlikely effector, since neutralizing anti-TNF-α + anti-TNF-β Abs had no protective effects (Fig. 7⇑B). However, TNF-related structures, such as TNF-related apoptosis-inducing ligand (53, 54) or the ligand of TNF-receptor related apoptosis-mediating protein (55), may play roles in CD4+ T cell-mediated down-regulation. In addition, IFNγ may be an important factor, since IFNγ production by CD4+ T cells is associated with SAg-dependent cytolytic activity (56). Future studies with CD95- or CD95L-deficient mice should enable us to more fully assess the contributions of CD95- and non-CD95-based pathways to in vitro and in vivo SAg-induced and -regulated Ig responses. It is not known whether the CD4+ T cells that effect SEB-dependent down-regulatory activity are the same as those that effect SEB-dependent helper activity. SED-reactive CD4+ Th2 clones were shown to be capable of promoting SED-dependent Ig production, whereas SED-reactive CD4+ Th0 clones suppressed Ig production and promoted B cell apoptosis in the presence of SED (57). However, since elaboration of soluble helper factors by the Th0 cells was not directly examined, it remains plausible that SED-stimulated Th0 cells, in the absence of intimate contact between Th0 cells and target B cells, can also promote Ig production. Further studies are needed to investigate this issue. CD4+ T cell-mediated down-regulation of PFC responses via a CD95-dependent pathway may have important ramifications for autoimmune disorders such as SLE. Genetic defects in CD95 or CD95L are associated with SLE-like illness in the mouse (50, 58, 59, 60, 61, 62, 63, 64) and in man (65, 66, 67, 68). Although most human SLE patients do not harbor detectable genetic defects in either CD95 or CD95L, defects in downstream signal transduction or in expression of critical cofactors may impair CD95-based down-regulation of IgSC responses in SLE and lead to excessive survival of autoantibody-secreting B cells. 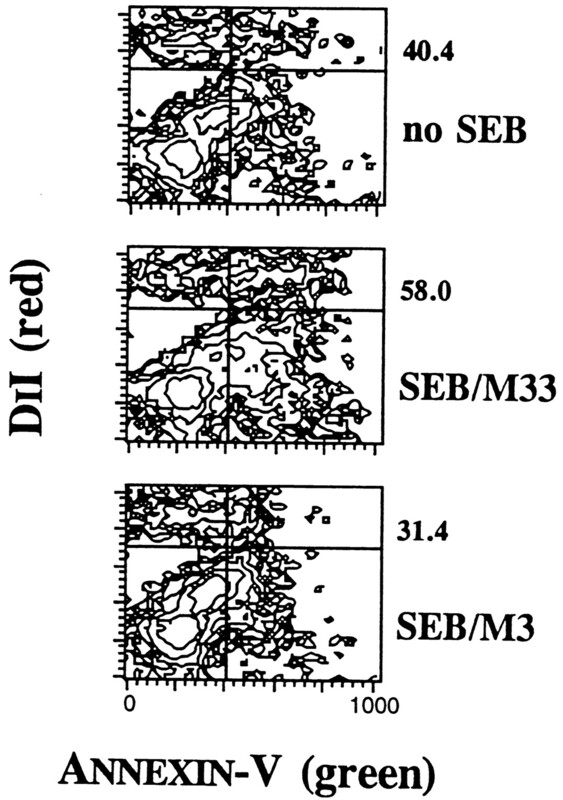 Indeed, the similarity in CD95 surface expression between low dose and high dose SEB-stimulated B cells (Fig. 5⇑) suggests that B cell CD95 surface expression per se does not determine susceptibility of the activated B cells to high dose SEB-dependent CD95-based down-regulation. Thus, normal up-regulation of B cell CD95 surface expression in SLE (30) does not mitigate against an important CD95-based SLE defect, an area of active ongoing investigation. We thank Drs. Stephen Stohlman, Günther Dennert, and David Horwitz for critical review of the manuscript; Iris Williams for assistance with the flow cytometry; and Anna Gilmore and Dong Xu for technical assistance. ↵1 This work was supported in part by grants from the National Institutes of Health (R01-AR41006), from the Arthritis National Research Foundation, from the Arthritis Foundation Southern California Chapter, and from the Robert E. and May R. Wright Foundation. ↵3 Abbreviations used in this paper: SAg, superantigen; CD40L, CD40 ligand; CD95L, CD95 ligand; DiI, 1,1′-dioctadecyl-3,3,3′,3′-tetramethylindocarbocyanine perchlorate; IgSC, Ig-secreting cell; PFC, plaque-forming cells; SAC, formalin-fixed heat-killed Staphylococcus aureus; sCD95L, soluble CD95L; SE, staphylococcal enterotoxin; SPC, SAg-presenting cell; SLE, systemic lupus erythematosus; PE, phycoerythrin.